“…enter houses through their proper doors” (2:189). For every door there is a key, and the key for unlocking the door to the heart is through obedience to the Divine will. We are asking, and always Mawlana Shaykh is teaching us, to be under the shade of these three trees of authority. They are like mighty oaks which protect us from the storms and floods of this life. In times of natural disasters, when floods and tsunamis are washing everything away, what remains are the trees. And you see many times on the news that people who are able to reach and hold on to the trunk of a tree are able to survive the flood. Mawlana is teaching us that if we hold to these three mighty trees we will quickly reach to our Lord’s satisfaction. For the gnostic and the knower of these Heavenly realities, this supplication encompasses the entire spiritual path, which is to surrender our will back to God. This comes through obedience to the Divine, and obedience opens servant hood, because a servant must obey their Master. But what is standing in our way is our ego. Therefore, tariqat/Sufism teaches that the highest level to achieve is not a PhD or a lawyer or an engineer. The highest level is to become a servant. It is most difficult on the ego and it is most pleasing in Divine Presence. God is saying, “I gave you free will. Now give it back to me,” and that is the test of our life, to give back our free will out of love for the Creator. This concept, “obedience to God’s will”, is the religion that all Prophets brought to humanity. 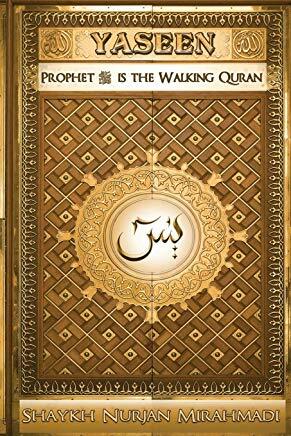 That is why all Prophets were saying, “Samina wa atana” (2:285), which means “we hear and we obey”. These three levels of obedience teach us a great deal about the Sufi path because God’s first command is to obey Him, and Sufism comes and teaches us to step back and humble ourselves and realize that we can never truly obey God. That is why Sufism is a way of humbleness. It comes against pride and it comes against arrogance by pointing out to us that we are in need of support, and by teaching us that there is an etiquette in how we approach the Divine Presence. God knows that we are a weak creation, constantly sinning and making mistakes. If we had to obey Him directly all of us would be in grave danger because we are not obeying. Therefore, we must show some humbleness in our approach. We are not Prophets, and we do not take our orders directly from the Divine, therefore we must seek to obey those who do. seek the means of approach unto Him” (5:35). Don’t approach God directly saying “I am who I am!” Don’t overstep your authority and ask to connect directly to God. That is ok in the beginning, but not when you are seeking to advance. Satan also wanted a direct connection and he was very advanced! He didn’t accept Adam’s authority and so he refused to bow, and for that he was thrown out of Paradise even though for 70,000 years he was in complete worship of the Divine. The Divine is teaching you that there is an etiquette involved in dealing with the King. You can’t just walk up and start speaking. There is a particular way to approach the thrown. You must keep your eyes down. You may have to drop to your knees, and if the King appoints someone to represent him and vests authority in that person, you can’t say, “No, I don’t accept.” If that is the protocol for Kings in this world, what about the owner of the throne in Paradise? “He who obeys the Messenger obeys Me.” (4:80). God is saying “look to the Messenger (s). I have sent him to you to teach you how to obey Me.” Prophet (s) is in complete submission to the Divine – he has no will of his own. Therefore, he acts as a mirror reflecting the Divine Presence towards creation. However, Prophet (s) is not with us, so how can we imitate his perfection? By obeying those charged with authority over us. That means spiritual and temporal authority. You must obey the police, the Mayor, the Governor, the Prime Minister and anyone who has been placed in a position of authority because who gave them that authority? The Divine! If it was not written and destined for that person to have that job, how could it happen? Tariqa comes to perfect our faith and learn to accept God’s will. That opens the spiritual reality, because there is a spiritual government just like there is a government in this material world. So if you must obey material authority, it means you must also obey spiritual authority, and there are Saints with different ranks and stations in that spiritual government who are inheriting from the Prophets. 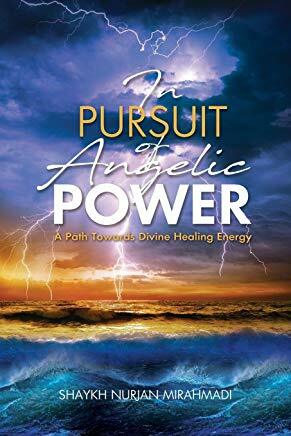 If you find them and follow them you will be in safety because they are on authority and that authority is coming directly from Divine presence. Saints are inheriting from the perfection of Prophet (s). Through spiritual training and constant remembrance of God, they have purified their hearts of all imperfections in character and in worship. It means that their hearts have become like mirrors. 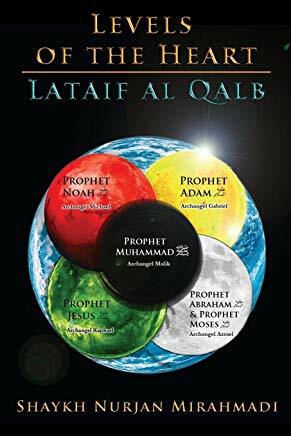 Whereas Prophet (s) is a mirror reflecting the Divine Light towards the Saints, the Saints in-turn are receiving the light of Prophet (s) and reflecting it towards humanity in our time. The Saints of the Naqshbandi Golden Chain are inheriting that light from Prophet (s) through the lineage of 40 Grandshaykhs, beginning with Sayedena Abu Bakr (r) and reaching us today with Mawlana Shaykh Nazim and His Deputies Shaykh Hisham and Shaykh Adnan. That lineage is like a rope reaching seekers in the 21st century and guiding them on their journey towards the Divine. Unfortunately, people today are no longer following Saints – they are only following their egos , Instead of riding your ego it is riding you. It is a strange phenomenon because in every aspect of our material lives we seek out experts. If we want to become a doctor, we go to medical school. If we want to become a lawyer we go to law school. In everything we do in life, we must learn from a teacher. You cannot open a practice without that stamp of approval on your wall that says you have been tested and verified as a real doctor by this school – it is not allowed. But you ask people today what school are you taking your spirituality from, they say “there is no need for that. I can read the Holy Books myself and come to my own conclusions.” For some reason, when it comes to spirituality many people reject the concept of learning from a master and follow their ego instead. But the Saints are teaching us that in dealing with life’s difficulties and trials, it is important to constantly be guided and inspired by people more pious than ourselves. These three levels of obedience are also symbolic of the 3 states of matter: solid, liquid and gas. The Divine is like the gaseous state: we can’t see it, we can’t taste it and we can’t smell it. In our physical, solid form it is impossible for us to interact with gas, and that is why God is saying “obey Prophet (s)”. Prophet (s) is symbolic of the liquid state which, like the gaseous state, is impossible to follow because it has no form. Obedience to Prophet (s) is like trying to hold liquid in our hand. Since we are solid we must find those with form to guide us. It means we must seek out a spiritual guide that we can learn from, one who is inheriting from the spirituality of the Prophet (s). These are the Saints who are dressed with the perfection of Prophet (s) because they are reflecting his light. 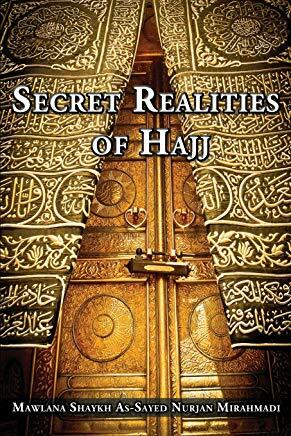 Therefore, when we look to them we see the reality of Prophet (s), just as the essence of liquid remains in its solid form. Through the Saints we begin to be dressed with the attributes of servant hood that Prophet (s) exemplified, and through servant hood we may enter the Divine Presence. To be a servant means to be nothing, to be gaseous. When we are trying to enter as something and someone it means that we are still in a solid state, but you can’t have form in Divine Presence. To be in the presence of God, Almighty and Exalted, you must lose your form like binary code. Binary code is made-up of a series of 1’s and 0’s. 1 means you are “on” and symbolizes your form. 0 means you are off; you are in non-manifest-existence; you are in a gaseous state. You must annihilate and efface your physicality if you are to reach the presence of the 1, which is the oneness of the Divine. It means you must become like a gaseous state, like a 0, complete effacement in the Divine reality. For matter to change states there must be a catalyst which creates a change within that existing state. For example, for a solid to become liquid requires tremendous heat. In Sufism that catalyst is the spiritual Mentor, the Shams al-Tabriz. Shams al-Tabriz was the name of Jalaludin Rumi’s (q) teacher and his name refers to the highest point of energy. 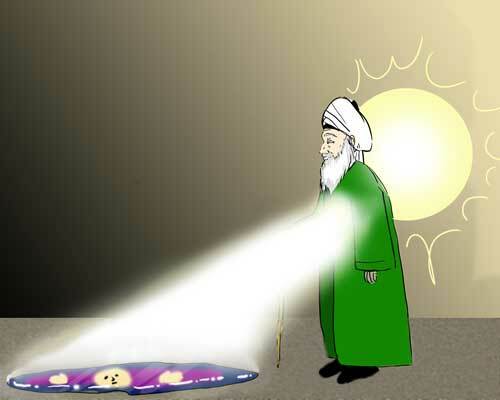 “Shams” means sun in Arabic, referring to the fact that the heart of Shams al-Tabriz was like the sun – lit with the light of guidance. Tab-Riz means Highest point of Heat. When Mawlana Rumi met Shams he was very firm and very scholarly. 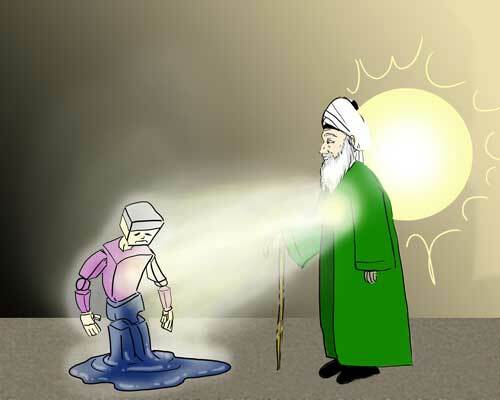 It means he was in a solid state, and he needed Shams al-Tabriz to melt him into a liquid state because to understand the knowledge of Saints requires a transformation. We cannot understand with book knowledge only. Like the letter of the law without knowing the Spirit of the Law – it is like trying to fit a square-block through a round hole. As an aside, this Hadith specifies the stages of personal progress and spiritual achievement. The Mountains refer to the Awliya, the Saints of God, who through great firmness of faith reach a station that corresponds with that which stabilizes the Earth, i.e. they balance the universe with their positive light and energy. The Mountain is unshakeable, solid and stable, and perfectly describes the rank of the Friends of God and of Prophet (S). Through their further development and evolution, and the application of spiritual power, Awliya then become Iron – absolutely firm and unbreakable. Iron not from the Earth but Heavenly sent. The next stage is Fire, wherein the Saint’s essence burns and is ignited with the flame of Divine Power from the Presence of God, a state that may melt even Iron. Afterwards, the Saint’s being and container becomes Water, a fluid mountain which responds automatically and instantaneously to the will of the Divine, and which may douse even Fire. This corresponds to a state wherein one is completely melted and annihilated in Bahr ul-Qudra, the Ocean of Power wherein all creation swims. Lastly, Awliya may reach the station of Wind, pure Prophetic Essence, subtle, ethereal, completely without mass – pure Divine Will. 55-29 In Every Moment in (new) Splendor doth He (shine)! 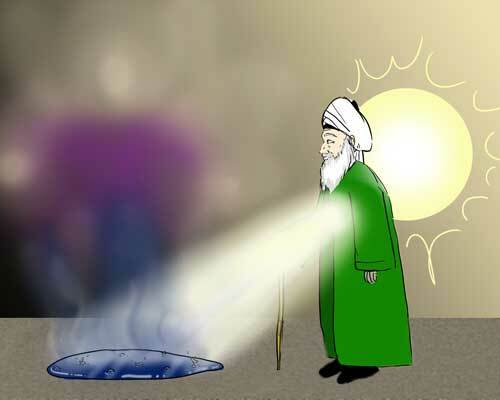 The Shams al-Tabriz exists in every time, symbolizing the Saints who can melt our ego through the power of their heart. They can melt us into a liquid state because they have the ability to intensify energy. In Classical Islam there are many examples of how the Grandshaykhs would melt ice or heat water just from their body heat. For example, during his seclusions Grandshaykh Abdullah al-Fa’iz ad-Daghestani used to use his spiritual power to melt a bucket of snow so that he could make ablution. This shows us that Saints are able to create a tremendous amount of spiritual heat, and through that secret they are also melting their followers to take them towards liquid and gaseous states. The Saints teach us how to become servants, and that process begins to melt the ego. In that process of melting we scream and struggle because our ego, our identity and who we think we are, begins to burn in that fire. It wants us to escape the fire. It doesn’t accept to be nothing and to be burned away, but spiritual Masters are teaching us to jump into the fire like the story of Prophet Abraham (as) who jumped into the fire of Nimrod. All of the Prophets have something to teach us. The story of Prophet Abraham (as) is teaching us that when you are lost in that love, throw yourself into the fire. Fear of that fire symbolizes fear of faith, but it is all an illusion. That fear is making us run away from faith and from spiritual practices. It makes you think that if you become spiritual you are going to be burned, but the reality is the opposite. When you move towards faith, what appeared to you as a fire is actually cool and peaceful once you are inside it. The Divine is showing you that instead of running away, you should move into the fire. That fire will burn our bad character, but once the bad character goes that fire becomes a fire of love and it is all-consuming. Then when the Saints have melted us, we enter a liquid state and we become like water. Water symbolizes submission Having a flowing quality without harshness or abrupt breaks. Whether you are poured into a bottle or into a cup, it no longer matters. How do we reach to that liquid state? Submit! Submit to everything by seeing every event in your life as coming directly from God, because every event and every test in our life is like a fire. Every time your boss yells at you, it represents that fire. The question is, do you fight fire with fire? Or do you throw water on the fire? It means, do you show no ego by saying “thank you”? Answer back with love, not anger, and throw water on the fire. The more we can put down our ego and respond with love, means the faster Saints can melt us into that liquid state. That is why, in the meditation you may feel your entire body heating up. Saints are releasing that energy and literally melting you into that liquid state. That liquid state occurs through love, as only love can melt the heart. When you are in a liquid state, it means you are submitting your will to the Divine will. Once you are in that state you will be quickly ascending because you are no longer fighting the Divine will. But in your physical form, the ego is struggle against Heavenly orders, making it incredibly difficult to accomplish one command from the Divine. If you are told to pray, your ego makes you to skip it. If you are supposed to meditate, your ego tells you to watch television instead, and this becomes the biggest delay to our progress. But as we move into a liquid state under the training of our spiritual Mentor, the process begins to speed up because the ego is submitting. Water flows in whatever direction the earth takes it. It doesn’t decide where it wants to go. The student in that liquid state must be the same, flowing in whatever direction the Divine is sending them. In that state of submission and obedience to the Divine will, Saints are able to quickly take us to the Divine Presence because to move from liquid to a gaseous state is faster. The most difficult part is to melt the physicality because it burns the ego, but once we are in submission the Saints can increase their energy and boil us into that gaseous state very quickly. Only in that gaseous state can we understand and truly experience Divine Love. We must be careful, however, because without spiritual practices we will not be able to withstand the heat. Those practices and disciplines are not empty or without purpose. They provide protection for us in our ascension to the Divine Presence, and it is extremely important that we do them. To enter into a gaseous state means that you have reached annihilation and completely effaced yourself in the light of your Mentor, in the light of the Prophet (s) and in the light of the Divine Presence. In that state of non-Manifestation the soul has the most power. It becomes free to travel and move anywhere at the speed of light, because gas is the most diffuse of all the states of matter. In the solid form, the physicality puts roots into the soul. The liquid and gaseous states, however, symbolize the increasing control of the soul over the physicality and its ability to move independently of the physical form. This is one of the secrets of the Shams al-Tabriz, which is currently manifesting through the Saints of the Most Distinguished Naqshbandi Order.